While growing up in the Arkansas Valley of eastern Colorado during the 1920’s, Vera Snyder could never have dreamed that she would author a book about her experiences eighty years later. At the age of ninety, the resident of Wind Crest retirement community authored and self-published Surviving the Simple Life, a memoir of the realities endured by women in the 1920’s, via Outskirts Press of Colorado. Inspired to write the book for her granddaughter, Ms. Snyder’s work received statewide recognition on May 17th, earning third place in the Autobiography/Memories book category of the 2012 EVVY Awards presented by the Colorado Independent Publishers Association. It was her mother’s influence that set Ms. Snyder on a career path in education. She received a Master’s Degree in elementary education from Adams State College, and she served throughout her career as an elementary school teacher mainly in impoverished schools. She was named Denver Public School Teacher of the Year in 1975. Upon her retirement, Ms. Snyder enrolled in Arapaho Community College to earn her directors qualifying certificate, and with her late husband, Gene, founded a preschool, The Children’s Learning Center. Together, they were named Englewood, CO Citizens of the Year in 2002, and the school is still operating successfully today. Since its publishing in March, 2011, Ms. Snyder says she has received consistent comments about Surviving the Simple Life. “First, people say that is interesting, which makes me happy. Then they are amazed that I made it as far as I did. And finally, they seem surprised that I authored a book at the age of ninety,” said Ms. Snyder. She has seen many changes in the world since those days in a four-room farm house with no running water. 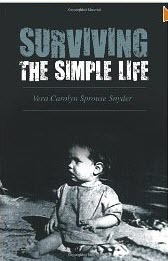 Surviving the Simple Life is available through Amazon.com.